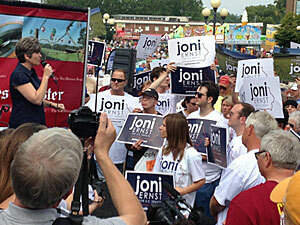 Joni Ernst at the Iowa State Fair. U.S. Senate candidate Joni Ernst delivered what she billed as “not a campaign political speech” at the Iowa State Fair today. During an appearance on The Des Moines Register’s “Soapbox”, Ernst talked about her service in the Iowa National Guard and she paid tribute to a soldier from her home area in southwest Iowa who was killed in Iraq. “I am going to take my time on this Soapbox to talk about something that I feel is very, very important…those brave men and women who serve in our armed forces,” Ernst said. Ernst did not mention her opponent, Democrat Bruce Braley, or the ads criticizing Braley for missing over three-quarters of the House Veterans Affairs Committee hearings when Braley served on the panel, but Ernst made a short reference to the scandals engulfing the Veterans Administration. “I am appalled at the heartbreaking way our Veterans Affairs Administration is being run today,” Ernst said. “Our servicemen and women have fought so very hard for us. We must stand up for them and we must stand up for their families,” Ernst said. Ernst began her day on the fairgrounds with a news conference alongside other Republican elected officials to tout the federal mandate for yearly ethanol production. The Renewable Fuels Standard for 2014 is in limbo as federal officials consider scaling it back. Ernst said during the primary season that she is philosophically opposed to all tax credits for selected industries, including the one for ethanol, but would support keeping it until the playing field is leveled and all tax credits are ended. Democrats have questioned whether Ernst has promised her campaign contributors from the oil industry that she would vote to do away with the Renewable Fuels Standard if she’s elected to the U.S. Senate. Republican Governor Terry Branstad jumped to her defense, saying he “resents” the ads running against Ernst, questioning her fidelity to ethanol. “We have had broad, bipartisan support for renewable fuels and for these people from California that have never supported renewable fuels is wrong,” Branstad said. Ernst is spending part of her day at the State Fair with the father of Jamie Kearney, a soldier from Emerson, Iowa, who was killed in Afghanistan in 2004. Kearney was the first Iowa soldier killed in the line of duty during the war in Afghanistan.